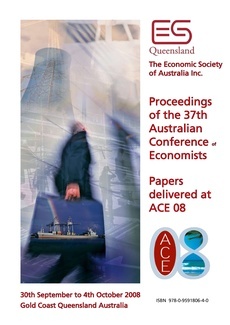 Copyright � 2008 Economic Society of Australia (Queensland) Inc.
Much has been achieved in Australia since the release of the Hilmer (Hilmer et al. 1993) report in 1993, especially in the recent decade with water reform. Prices are beginning to reflect full costs of supply. The same engagement of the reform agenda can not be said for urban waste water and ocean outfalls. Much of urban water conservation relies on prohibition or regulation. This paper presents a theoretical framework for analysing the re-use and disposal of waste water in urban communities in Australia. Many of these communities, especially all the state capitals, rely on ocean outfalls to dispose of their waste water. The framework takes a broad view of the value of recycling water and helps to analyse why the market for recycling fails. The reasons are classic. Prices for water use do not reflect their full cost. Externalities are not internalised. Services are monopolised where natural monopoly theory is questionable. The paper also presents survey evidence as to whether we may change our preferences for how we manage our waste water if we visit an outfall or treatment plant. Responses do change as a result of visiting these sites and this might be part of finding an improved understanding of, and solutions to, our water problems.